When we were emailed the list of themes for this season “Sunshine” was the one I was crossing my fingers that I’d make it to. It was the only theme that I knew immediately what I wanted to do, so needless to say I am beyond excited that you all liked it too! much weight you will have in your swing and buy accordingly!!! 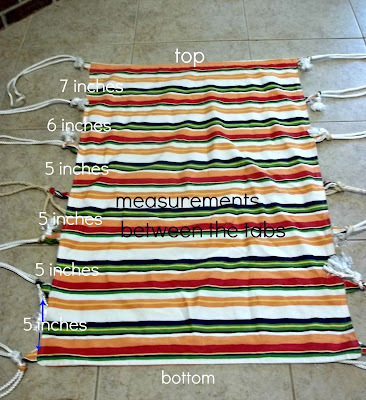 Measure and cut your fabric. Open up the fabric so you can see the whole piece. Fold it back over itself so you have a piece that measures 45 x 36. To cut the swing piece measure from the cut edge back toward the fold–you’re going to need every bit of those extra six inches at the fold!!! 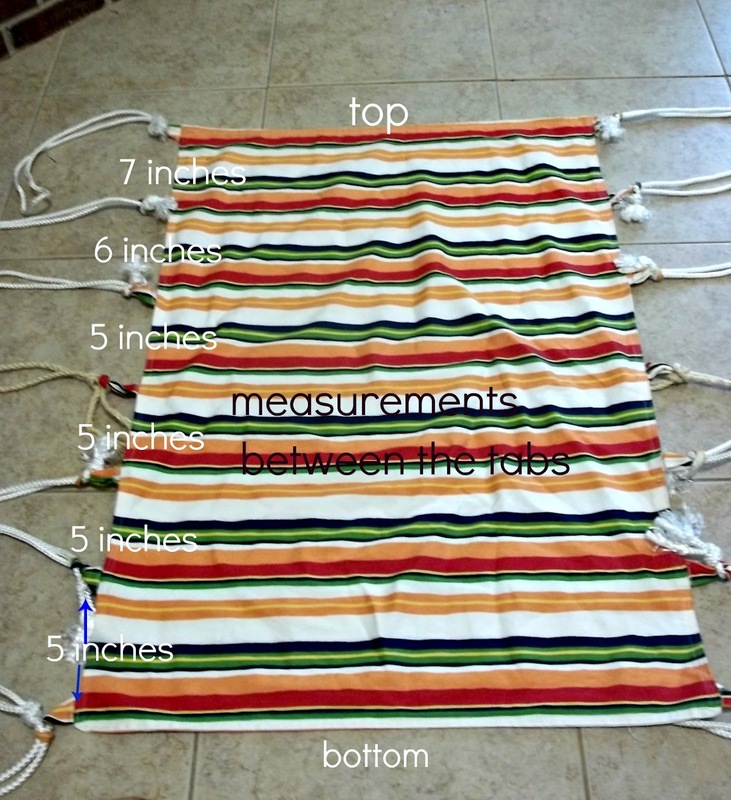 Cut a double layer of the swing fabric to measure 45 inches long by 33 inches wide,with right sides together, set aside for a few minutes. 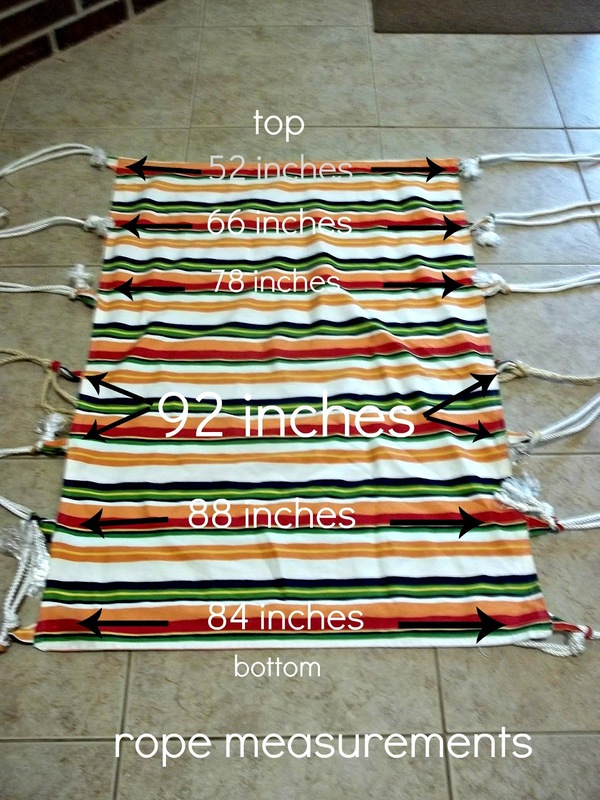 Use the extra strip of fabric to make the tabs for the side of the swing. Cut 14 pieces, each measuring 6 inches long by 3 inches tall. Sew all of the tab pieces. Fold the fabric in half, right sides together, so you have a piece that is now 6 inches long by 1.5 inches wide. 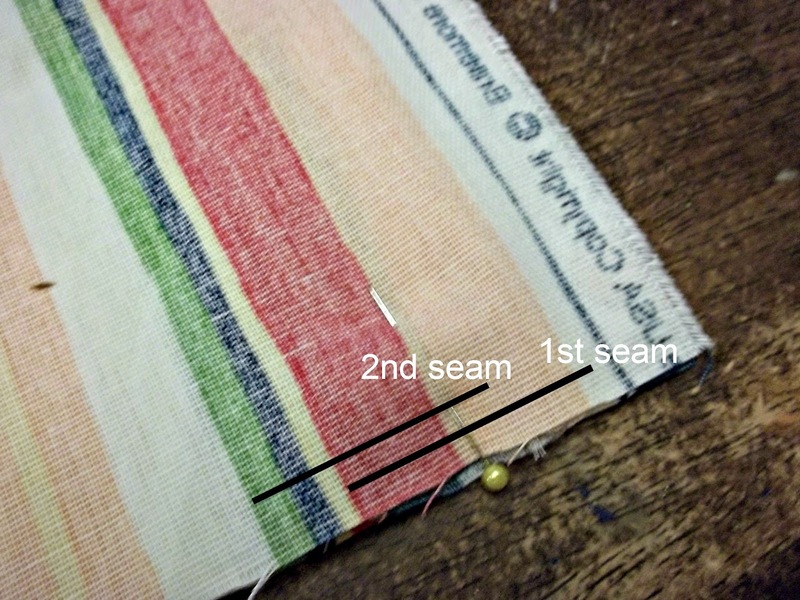 Sew the tab closed along the 6 inch side using a 1/4 inch seam. **I double sewed all of my seams, if you have a serger just run it through there! 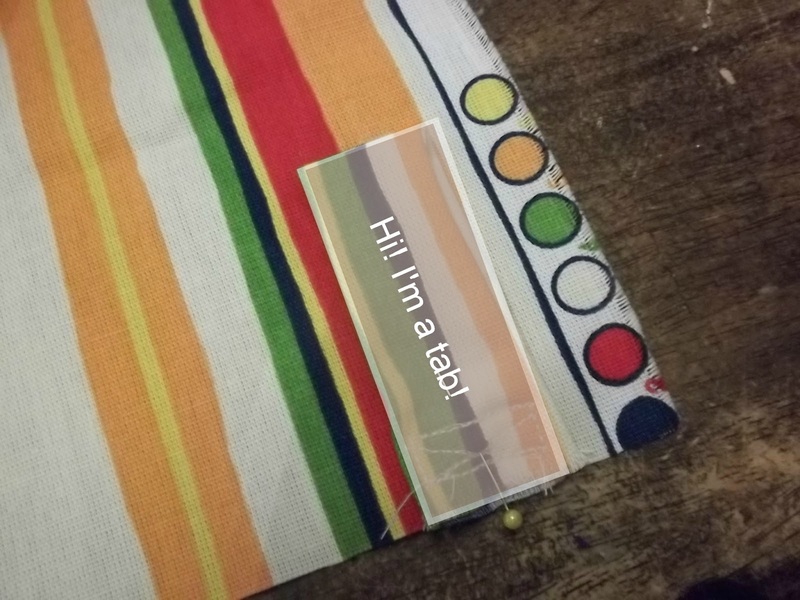 Turn the tab right side out and fold in half matching up the cut ends. Your piece should now be 3 inches by 1.25 inches. Sew the ends shut so that you now have a sewn loop/tab. I made a rectangle at the bottom of each tab and then criss-crossed through the rectangle–these babies aren’t coming undone! Pin the tabs into place. Fold up the top layer of fabric along the 45 inch side. Measure up from the bottom one inch and pin a tab into place. Measure up 5 inches from the first tab and pin the second one into place. Measure up another 5 inches from the 2nd tab and add the third tab. Repeat this for the fourth and fifth tabs.Measure up 6 inches from the fifth tab and pin in place the sixth tab, and then measure up 7 inches to pin the last tab into place. This is after it’s been sewn and flipped, but shows the space between the tabs! Be sure the sewn edge of the tab lines up with the cut edge of the swing and all tabs point into the center of the swing. Replace the top layer of fabric, line up all edges, and then carefully remove the pins from the tab and replace them going through all three layers–top, tab, and bottom. Repeat on the other side of the swing! Leaving the bottom open, sew a 1/4 inch seam along the side, top, and side of the swing. 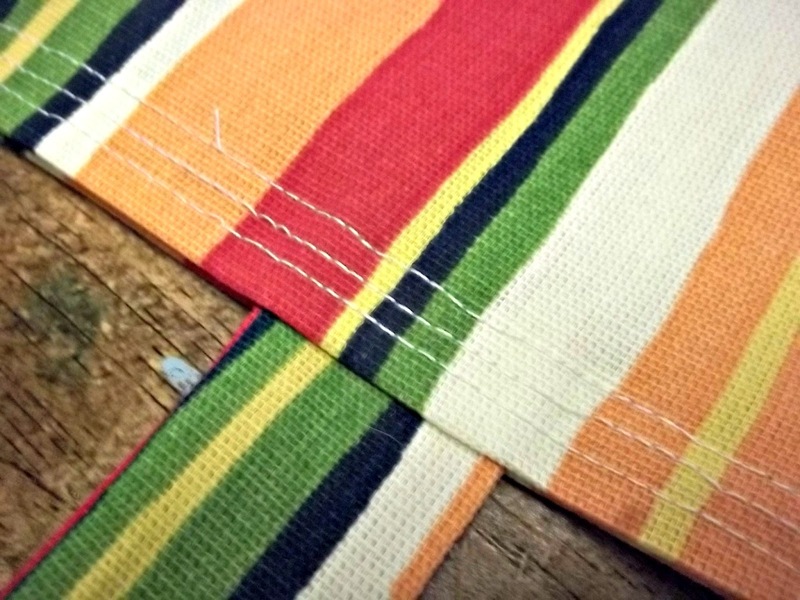 I then used that seam as my guide and ran a second seam another 1/4 of an inch in. Fold the bottom inch in, pin in place, and then iron all the edges flat. 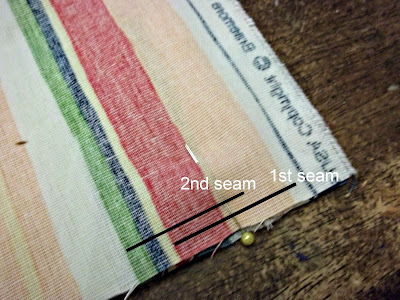 Sew a 1/4 inch seam around the entire piece. Use that seam as your guide and run a second seam around the swing, and then repeat to make a third seam. Remove the pins from the bottom edge and the base for your swing is done! Cut and tie the ropes for the swing. Starting at the bottom, fold one length of rope in half. With the ends together, loop them around and through themselves to from a knot at the base of each piece. Use a flame to melt the ends of the rope ends. Slip the knotted end through the tab on the swing. Tuck the other end of the rope under the knot, but over the tab and pull until taught. Push the knot down onto the tab so that the fabric ends up on top of the knot. Move to the opposite side of the swing and tie that piece into place.Repeat with each remaining piece of rope until all 14 pieces are knotted onto the tabs. Measure in on the dowel 7 inches from each end and add a small screw. This will keep the rope from sliding in on the pole. Add the rope loops onto the pole starting at the top and working your way down. Do this for both sides of the swing. I had my hubby help with this part as his knot tying skills far surpass mine, but I held the swing up and level while he wrapped a scrap piece of rope around the loops twice and tied it together in an official Boy Scout square knot! I did cut and then burn the ends all by myself though. Cut one last piece of rope 10 feet in length. Fold it in half, and then half again so that you are holding one loop and the two tails. Slide the carabiner onto the folded rope and tie a knot around it, securing it in place. Yeah, it’s different rope, that was the “trial and error” part–not enough nylon rope the first go around! Separate the two looped ends and tie a knot into each one leaving the loop big enough to slip over the end of the dowel but not too big that it slides right over the gathered ropes already on the crossbar. I slipped the loop onto the dowel before I pulled the knot tight so that I could adjust it to the dowel. Last step! Are you ready? I used an envelope casing for both cushions cause it’s quick an easy and makes washing the casings a breeze. 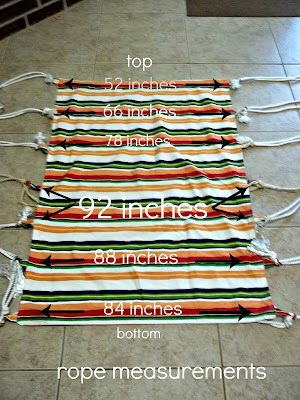 The bottom pillow fabric was cut to 45 inches x 21 inches and sewn with 1/2 inch seams at the top and bottom and has a 2.2 in overlap. The finished size is 21 x 20. *Just a little fyi, I used the salvage edges so I didn’t have to sew seams on the “envelope” part. 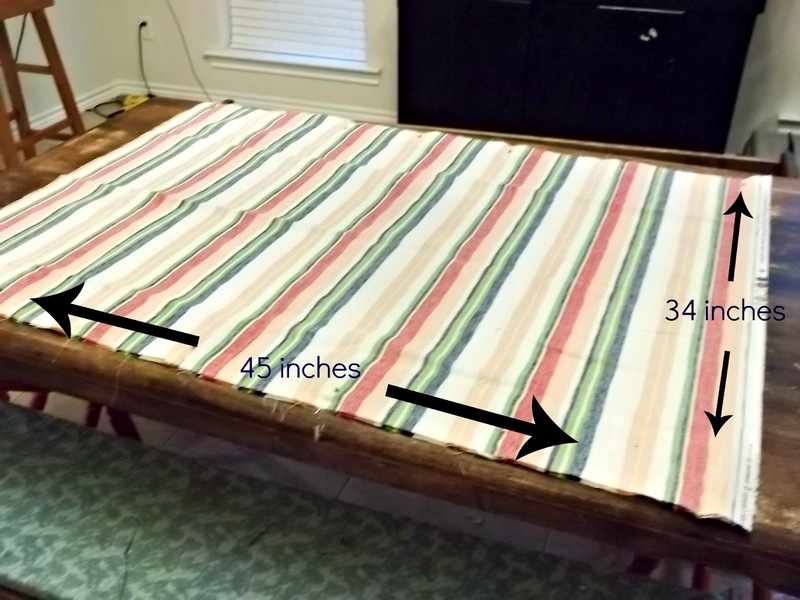 The top pillow was cut at 45 inches x 16 inches. Again, sewn with 1/2 inch seams at the top and bottom, has a 3.5 inch overlap and uses the savage egdes as the overlap hem. Finished size is 20 x 15. Plop those babies into the swing and smile big because your new sunshine-enjoying swing is done! Mine is currently hanging from a beam on my patio. We screwed an eye screw into the beam and then slipped the carabiner onto it. Pure happiness! Thank you so much for letting me share this with you and for all your thrilling votes! I really am just tickled that you liked it. Enjoy your swing and the summer sun…happy crafting! wwwoooowwww!!!! it’s a great tutorial!! I like it very much! I’ll write in my list of super-crafts pendings!! thanks. I love this and plan on using your plans to make this wonderful swing. Huge live oak trees surround our older home and I have a bunch of grandkids that love to read and this would be the perfect place to have your swing. Thank you so much. I love this swing…and the tutorial is great! Thank you for sharing! I am going to make one..then I will figure out where to hang it LOL So awesome! I just came across this on pinterest, and I love it! 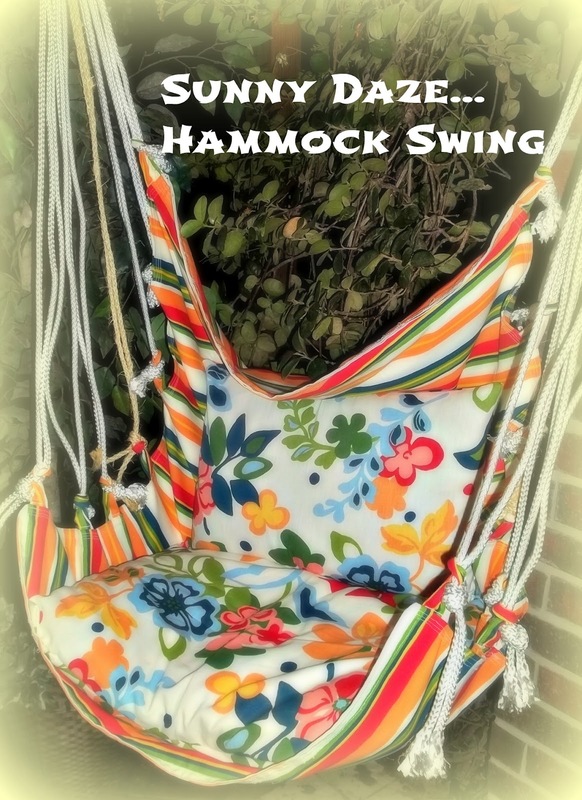 I want one of these for my kids this summer, but I had never thought of just making my own! I have one question, though: Do you have any pictures of the finished swing that show the dowel and how all of the ropes (including the hanging rope) are attached? That would be so helpful! Thanks! My wife and I are planning on making a couple of these next weekend, but I had one question: How long did you cut the dowel rod? Thanks! Hi guys! A few quick answers for you about the dowel and ropes. I’ll send a picture to Missy of the swing in all her glory hanging up so that you can see the ropes in action. And as far as the dowel itself, I didn’t cut it all. It went straight from the shelf at Lowe’s to the swing, but just in case it measures 48 inches long. Hope that helps! Let me know if I can answer anything else for you and have fun with your swings. I am so excited to make this! Have you thought about making a footrest? I wonder how I could attach it. Can I see the picture of the dowel with the ropes attaches, please? Thank you! Debi, Yep! I still post on my site every week. Sadly it’s a technical update that caused the photo issue. Unfortunately, I am not sure when I will be able to recreate and photograph the entire project again to stabilize access. Sorry!